You can now give your business partners and employees read access to your Tide account, allowing them to view and download transactions on your behalf. Read access makes sending transaction files one less thing for you to worry about – whether your team uses it to upload transactions into your accounting software, expense management or forecasting, they’ll be able to access your account directly. What’s more, they’ll be able to download transaction data for your accounts in CSV formats that are directly compatible with major accounting softwares, such as FreeAgent, Xero, QuickBooks and Sage. We’re big fans of teamwork here at Tide. So much so that we’re building out more ways for you to collaborate with your team. Last month, we announced Team Cards – and we’re going to continue improving the ways your team can access your account in the coming months. First, log into Tide on the web. Once you’re in, click Account Management > Read access > Manage read access. You’ll then be able to add team members by entering their email addresses and mobile numbers. Keep your mobile handy – you’ll need it to authenticate your request. Yes. Read access is provided through a separate dashboard, meaning that team members with read access will only be able to view and export transactions. No other action can be taken via the dashboard. How will my team members access my account? Once approved, your team members can get read access to your account by logging on to the Read Access dashboard on a desktop device. Who can I give read access to? Whoever you like! But we think it’ll be most useful for our members who want to give access to their business partners, finance and admin teams, to support with accounts preparation and expense management. You can also invite your external team members – such as your accountant – to have read access. My accountant already has access to my account. Will that change? If you’ve already given access to your accountant via the Account Reader, nothing will change. You can review who has access at any time in your Tide app, by selecting ‘Data Permissions’ from the ‘More’ menu, and deleting any connections you don’t want. What’s the Account Reader? Should I use that instead of giving read access? 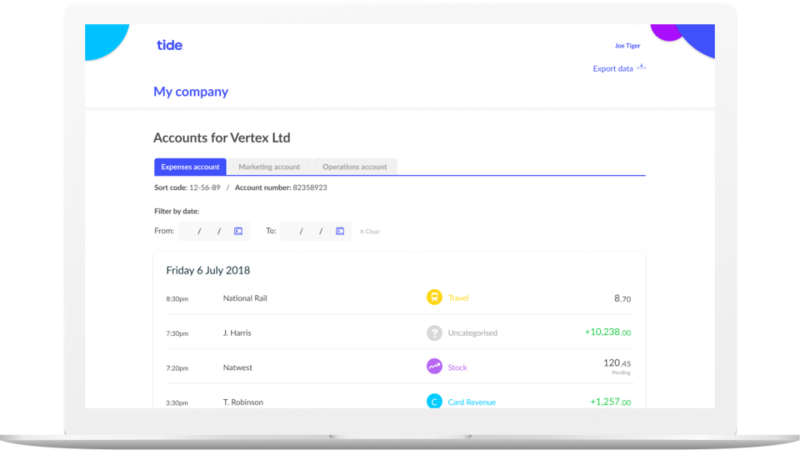 The Account Reader allows accountants (or other business support professionals) to access multiple Tide accounts on behalf of their clients. If your accountant has multiple clients using Tide, we’d encourage them to create an Account Reader profile, which they can do here. How can I review who has access to my account? Log into Tide on the web and select Account Management > Read access > Manage read access to see who you’ve granted read access to. If you’d like to revoke access for a specific team member, send a message to our Member Support team and they’ll action it on your behalf. We’re working on adding this functionality in the near future. You can revoke access for all team members in your Tide app – tap More > Data permissions > Tide read access > Delete.